Douglas R. Ewart’s Crepuscule, at Wilfred Laurier’s Robert Langen Art Gallery, is a multimedia, interactive installation and exhibition of music, film, sculptural assemblage, and performance art, exploring the role of improvisation in building and strengthening community. Douglas R. Ewart is a versatile composer, improviser, sculptor, and maker of masks and instruments. He is also an inspiring and enthusiastic educator and lecturer. Throughout his acclaimed 40-year career, Ewart has led projects in diverse media, weaving his many talents into a single sensibility that encourages and celebrates the wholeness of individuals in culturally active communities. 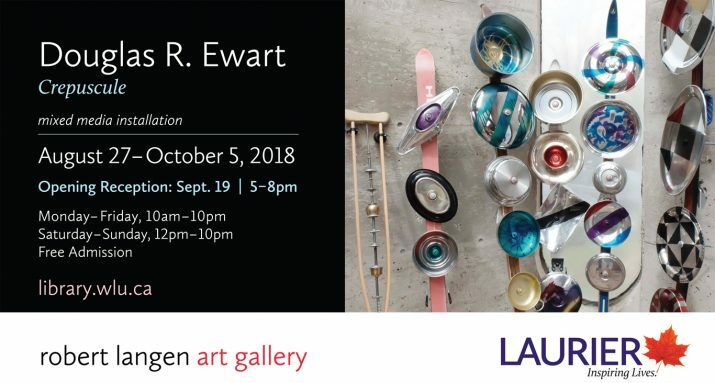 Born in Kingston, Jamaica, Ewart began experimenting with making toys and instruments from found materials at an early age. After immigrating to the US, he learned to be a tailor, developing skills now crucial to his costume-making. He also studied saxophone and clarinet at the Association for the Advancement of Creative Musicians (AACM). In the years since, he has since learned shakuhachi flute construction, performance, and history with Japanese masters, as well as the didjeridu with native Australian masters. Ewart is a renowned craftsman. His shakuhachi and bamboo flutes, rain sticks, and kinetic sound sculptures have been exhibited internationally. He is also a master saxophonist and wind player who has toured the world solo and with leading members of the sonic vanguard. In addition to recording his own compositions, he has appeared on albums with George Lewis, Anthony Braxton, Roscoe Mitchell, and Henry Threadgill, among others. Ewart is the recipient of a prestigious Bush Foundation Fellowship in Music Composition and is the former chair of the Association for the Advancement of Creative Musicians (AACM). The Robert Langen Art Gallery is wheelchair accessible.